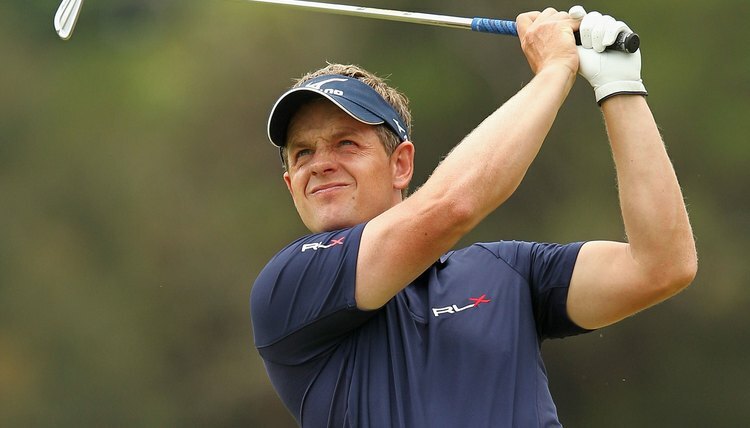 Great Britain's Luke Donald earned more money on the golf course than any other pro in 2011. A golf professional's earnings cover a very wide spectrum, based on the golfer’s ability, whether he plays on a pro tour and whether he endorses any products. Even at the top level, a golf pro’s earnings aren’t necessarily stable or long-lived. If a PGA Tour player is injured or has an off-year and loses his Tour card, his income will likely fall precipitously the following year. Club pros generally enjoy more stable, though much lower, annual incomes. Money earned on the PGA Tour varies from year to year and from golfer to golfer. In 2011, a total of 261 golfers earned money on the Tour, ranging from Jose Maria Olazabal ($6,330) to Luke Donald ($6,683,214). The player at the midpoint of the money list – Angel Cabrera at No. 131 – won $628,079. On the Nationwide Tour, a developmental circuit one step down from the PGA Tour, 305 players won money in 2011, led by J.J. Killeen’s $414,273. Joe Ida brought up the rear at $1,265. Steven Alker, the midpoint money winner at No. 153, earned $16,904. Tour regulars must pay a variety of expenses out of those earnings – including travel, lodging and food – while traveling from event to event. The most lucrative pro tour outside of the U.S. is the European Tour, although many American players participate on the circuit. Donald was also first among 325 European Tour money-winners in 2011, earning 5,323,400 euros (approximately $6.9 million). Jack Doherty was at the bottom of the list at 891 euros (about $1,156), while No. 163 Steve Benson was at the midpoint with 116,924 euros (about $151,746). Juvic Pagunsan led 151 players on the 2011 Asian Tour money list, earning $788,298, while Nicholas Pua was last in earnings at $565. At the midpoint of 76th place, Chris Rodgers earned $47,701. Several developmental pro tours are based in the U.S., commonly referred to as “mini-tours.” Two of the most prominent are the National Golf Association (NGA) Pro Golf Tour and the eGolf Professional Tour. Brandon Brown led 349 NGA money-winners in 2011, earning $150,864, while Austin Bowen was last at $600. Justin Ahasic was at the midpoint, ranking 175th with $5,027. Corey Nagy topped the eGolf Tour money list in 2011, earning $89,607, and Karim El Hali was last at No. 316, taking in $750. Ivo Giner, the midpoint earner at No. 158, won $4,250. Some top golf pros earn much more money off the course than they do playing. For example, a "Sport Illustrated" list of the highest-earning American athletes in 2011 was led by two golf pros. Tiger Woods earned almost $63.3 million on the year, $60 million of which came from endorsements, according to the magazine’s calculations. Phil Mickelson earned almost $61.2 million in 2011, including $57 million off the course. Woods and Mickelson also topped the "Golf Digest" list of golf's top 50 earners in 2011, but the third-place finisher was Arnold Palmer. The retired golf legend didn’t win any money on the golf course but raked in an estimated $36 million from a variety of sources, including golf-related endorsements, licensing and appearance fees. Club professionals may win some money in local or regional tournaments they play in, but they earn most of their income from regular paychecks, often supplemented by lesson fees and pro shop revenue. According to the PGA of America's compensation survey for 2010, PGA head pros made a median of $68,600, with the range from $40,000 to $140,000. Assistant pros who are full PGA members made a median of $37,000, ranging from $22,000 to $59,000. In contrast, assistants who are apprentices made a median of $28,000, with a range of $18,000 to $43,000 per year.